At the end of 2005, Rob Archangel heard through coworkers at New York University’s Recycling Center that green power was available in New York City. “As soon as I found out, I signed up,” he recalled. Archangel is just one of thousands of New York City residents who have elected to pay slightly higher rates – about ten percent higher in Archangel’s case – for electricity that doesn’t burn carbon. When ConEd Solutions started offering 100 percent wind power in May, 2006, he signed up for that, too. In the five years they’ve offered green power, ConEd Solutions has seen “a ramp-up of interest,” said spokesperson Christine Nevin. Nearly one in six residential customers have made the switch, and wind energy has quickly soared in popularity according to Peter Blum, another representative of the company. Large corporations like Archangel’s employer are following suit. 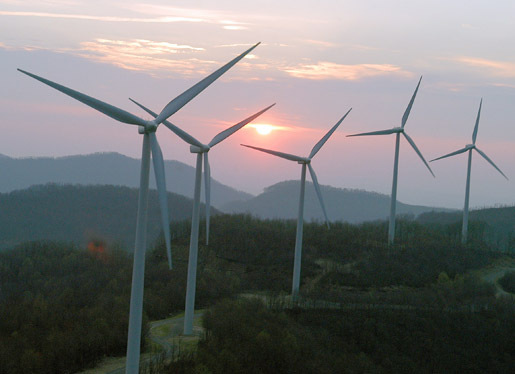 In October, 2006, NYU purchased 118 million kilowatt hours of wind power, enough electricity to power every part of the school for a full year, making the university the largest purchaser of renewable electricity in New York City and the 11th largest purchaser in the nation at the time. The purchase still ranks 18th nationally according to the Environmental Protection Agency’s Green Partner Program. “The principle behind voluntary sales has always been paying more to make a difference,” said Ed Holt, an independent consultant who specializes in voluntary green markets. When Archangel spends an extra 2.5 cents per kilowatt-hour (which adds up to less than $10 a month for most apartments), the money goes towards building wind farms as replacements for fossil fuel plants that belch greenhouse gases and health-harming chemicals. Although this type of purchase provided peace of mind for Archangel and positive press for NYU, such voluntary spending is not enough to make wind energy profitable. When it comes to power generation, wind energy is about as clean as it gets–no emissions, no byproducts and fewer negative land impacts than other green technologies–but the benefits have their price. Wind farms only provide power when the wind blows, while we demand electricity around the clock. Utilities often have to spend extra money purchasing back-up power for calm days. To turn a profit, “we need to be selling our power at about $100 a megawatt,” said Mike Adams, whose grassroots NY Wind group works with ConEd Solutions and Community Energy, one of the largest producers of wind energy in the U.S. Adams noted that wind power sells for the same rate as power from any other source – about $65 per megawatt. The wind companies can recover an additional $17 through federal tax credits, but the other $18 has to come from selling renewable energy credits, or RECs as they are known in the industry. A type of subsidy payment, a REC is an artificial commodity meant to represent the environmental benefits associated with a particular amount of wind energy. RECs are necessary because customers can’t directly link to power sources of their choice. The electrical grid is like a pool where water is both poured in and drawn out at many different places at the same time. Just as it would be impossible to draw out the same bucket of water that a friend pours in at the opposite end of the pool, there is no way for Con Edison to take electricity only from Community Energy. Instead, everyone buys electricity out of the common pool. It’s the RECs that Achangel and NYU are actually purchasing when they buy wind power, an additional subsidy that they hope encourages more investment. While it would be ideal to sell wind power directly, “behind the scenes, there’s almost no other way to do it,” said ConEd Solutions’ Blum. Community Energy spokesperson Paul Copleman observed that while “it’s fair to say that the REC revenue is not the dominant one” for wind power companies, both revenue streams – RECs and power sales – are necessary to make wind generation attractive to investors. But even if no residents were “happy to put some money into it,” as Archangel says, new wind farms would still spring up, and many RECs would still get purchased. That’s because 20 states have adopted renewable portfolio standards that mandate a certain percentage of power consumption that must come from green sources. New York has arguably the most ambitious portfolio, which requires 24 percent of the state’s power to come from green sources like wind, solar and geothermal by 2013, according to the U.S. Department of Energy. To reach these mandates, Saintcross purchases RECs that the state retires. This mandatory market creates a demand for green energy all on its own. “There’s no doubt that the mandatory market is larger,” said Blum of ConEd Solutions. Holt said he estimated that about 82 percent of the total demand comes from mandatory markets, with individuals and corporations purchasing the other 18 percent. “I don’t think most consumers are aware that power will be increasingly renewable overall,” said Chris Young, a policy specialist at the Pace University Energy Project, a research arm of the law school dedicated to sustainable energy, adding that the public often overlooks the large impact of mandatory portfolios. Although energy analysts expect mandatory markets to dominate for the next few years, the voluntary markets are growing, and may begin to close the gap by the end of the decade. The voluntary demand has been growing, largely due to large purchases from big institutions like NYU, according to independent consultant Holt. He projected that voluntary markets may make up nearly half the demand for RECs by 2010 in a report he co-authored for the National Renewable Energy Laboratory in Boulder, Colorado. Community Energy’s Adams hopes that in another five or ten years, New York’s portfolio will no longer seem aggressive.He believes voluntary markets demonstrate the commitment of people demanding even more than what the renewable portfolio standards require. By increasing public pressure for more renewables, “the standard offer will eventually become greener, sooner,” he said. New York State project manager Saintcross is more cautious in his optimism. He believes that, rather than become more ambitious, the mandates will disappear as soon as there is enough voluntary demand. “A renewable portfolio standard is basically an intervention, that’s the way the regulators have viewed it,” he said. To Adams a voluntary market of individuals and businesses sends a strong message regardless of its limitations. “A vote where they’re spending more money is really a substantial vote,” he said. Check out the green power options in your state at The Power Scorecard. Lets keep the momentum going!! !